Faculty of Education: As a child, what was your favourite subject in school? 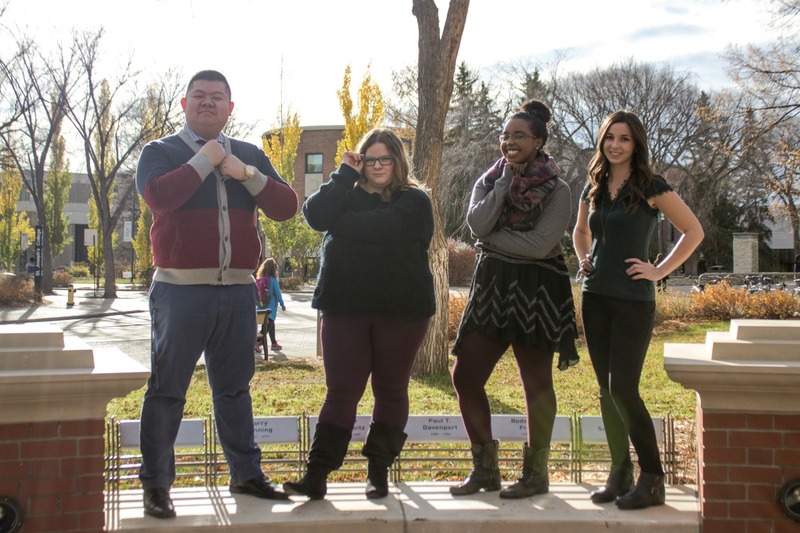 Faculty of Education: What made you want to do a degree in Education at the U of A? Hanan: My Grade 10 English teacher was my favorite person at the time, and so I decided I wanted to be him—he too did an English major and ESL minor during his undergrad. I also researched the various Ed programs in the country, and it turned out that the U of A had one of the most celebrated programs in the country. Faculty of Education: If you could have dinner with anyone—living or dead, famous or non-famous—whom would you pick and why? Hanan: Bob Dylan. I feel like I've got so many questions to ask him about his relationships with the beatniks and his processes to keep writing and performing in the ‘60s. I’m a huge fan of the movement [Beat Generation] and Jack Kerouac, but for some reason I feel like Bob Dylan would be a lot more approachable than the other creatives. Faculty of Education: Tell us one fascinating thing you’ve learned in one of your classes this term. Hanan: There’s a Canadian publishing company run out of Toronto called BookThug. The name, to me, was super fascinating and contemporary for a publishing company. They look to publish experimental and innovative literature that combats the traditional aesthetics of books. I’m so impressed by the name, mostly. Faculty of Education: Last question—describe yourself in just three words. Evan: My favourite subjects while I was a kid were the sciences and social studies. The reason behind those was science was about learning how everything works around us, whereas social studies is about how people work. That is always fascinating to me—I love learning how something works. Evan: This is really two questions for me: why I chose Education, and why I chose the U of A. I worked as an analytical chemist and a biologist before I went to get my degree in Education. I loved the science aspect of it, but I didn't feel like I was accomplishing anything in what I was doing. I had the opportunity to work with a youth organization during my time in the science field in a mentor role, and I absolutely felt fulfilled in it. This was the main contributing factor to my decision to become a teacher. The second part of this question is why I chose the U of A. This institution has been a dream of mine to go to since I was very young. It always seemed like it was out of my grasp and something to strive for. The purpose and culture of the university also fits with what I like to live by: "whatsoever is true" (quaecumque vera), as I try to be as honest as I can be. Evan: If I could have dinner with someone who has passed away, I would probably want to have Mark Twain join me. I love classical literature and especially those stories about regular characters. I like learning about historical figures, but it is the everyday person back in time that I enjoy learning about the most. Plus, he is one of the cleverest American novelists to have lived. Evan: The most fascinating thing that I have learned this semester might seem like a cop out: it is accepting that I do not know. That might make me wise like Socrates, but I believe that it is a good thing to go back to. It humbles you and keeps you honest. If there are any social studies majors reading this, be okay with not knowing something in its entirety. Faculty of Education: Describe yourself in just three words. Evan: Honest, committed, and relaxed. Samantha: Math. I remember when my parents got me a Grade 5-6 math book when I was in Grade 3, and that was the best birthday gift ever. Samantha: I have always loved helping people, and it is important to me to make a difference in peoples' lives. Education just seemed like the perfect fit, and the U of A has a great education program. Samantha: Coco Chanel. “In order to be irreplaceable, one must always be different.” She was an intelligent, insightful, remarkable woman. I would love to learn more about her life from her perspective, and learn more about what inspired her greatest creations. She faced a lot of adversity throughout her life and was still arguably the most influential person in fashion and equality for women in the workplace. Faculty of Education: Tell us one fascinating thing you've learned in one of your classes this term. Samantha: In Life, Leisure and the Pursuit of Happiness (RLS 100), I learned that leisure is largely based on work. If you love what you do, you'll keep doing it in your spare time. If you don't love what you do, you'll do the complete opposite in your spare time. Faculty of Education: That is interesting! Last question—can you describe yourself in just three words?